In the printing office, I am working on this year’s Greetings Card – rather later than usual. I will keep you posted! Meanwhile I thought it might possibly be interesting to look at some of the Cards from previous years. This was a very early (still in Blackheath) one and was one of the very few that was not tied to ‘work in progress’. 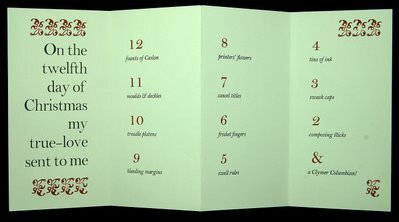 It was designed to be found amusing by fellow printing addicts and, for such folk again, I will write out the words which are too small to read. 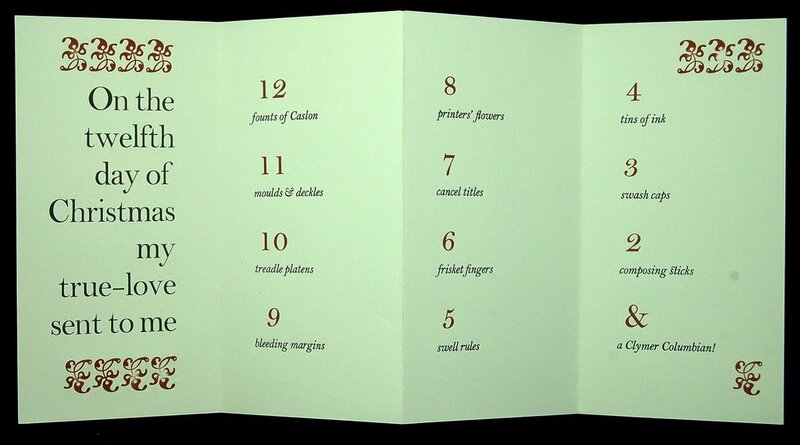 12 founts of Caslon, 11 moulds & deckles, 10 treadle platens, 9 bleeding margins, 8 printers’ flowers, 7 cancel titles, 6 frisket fingers, 5 swell rules, 4 tins of ink, 3 swash caps, 2 composing sticks & a Clymer Columbian! Below is another very early one made while I was about to start work on The Lad Philisides(now sadly almost sold out) which has always been one of our favourite books. Harry Brockway had begun to produce the most delectable wood engravings but had started with this one – to be used on the colophon page, which is why it involved a ‘stile’. I was to gain ‘practice’ in the printing of the blocks by printing it for this card. 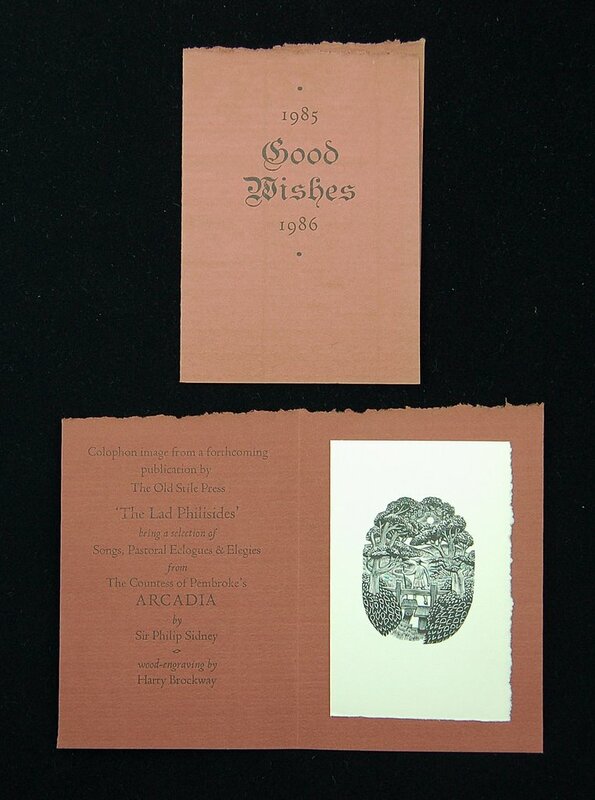 I thought the result was rather good but Harry gently took me aside and expounded his views on imparting a ‘silvery’ quality to the printing of his blocks. It was a lesson well learned and I look now at the engravings in the book and cannot quite believe that I printed them. The card was printed on a pile of offcuts of the delicious Fabriano Roma bought for £1 during a group visit to Christopher Skelton’s printing works at Wellingborough. This card is quite a recent one. 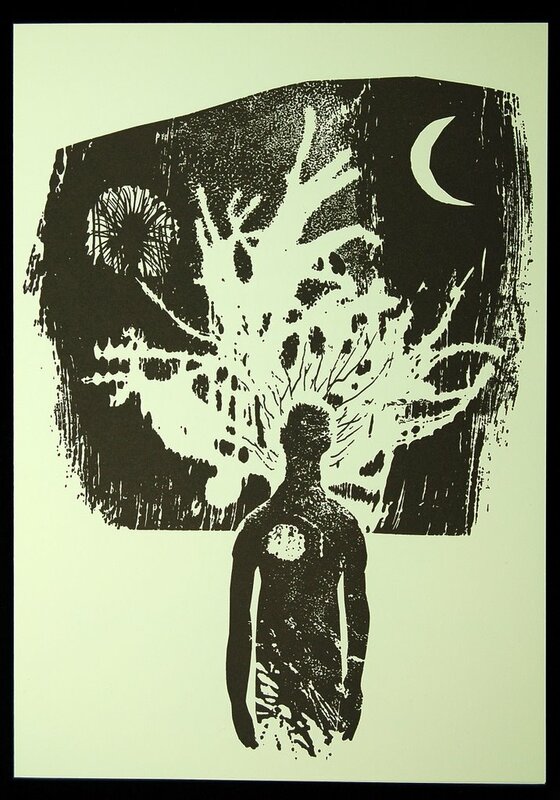 The image is the one made by Sara Philpott for the frontispiece of Poems of Light, the first book by the Romanian poet Lucian Blaga, wonderfully translated by our friends Oltea Simescu and Eric Williams. I might just return to this theme later and drag out a few more cards from the bottom drawer!